In ArcGIS Pro, a temporal profile serves as a basic analysis tool for imagery data in a time series. Visualizing change over time with the temporal profile allows trends to be displayed and compared with variables, bands, or values from other dimensions simultaneously. Using the functionality in temporal profile charts, you can perform trend analysis, gain insight into multidimensional raster data at given locations, and plot values that are changing over time in the form of a line graph. A temporal profile chart is interactive—where selecting one point on the temporal profile seamlessly switches the map display to the time slice from which the point value was extracted—which provides a convenient way to navigate through the data. Temporal profile charts can be used in various scientific applications involving time series analysis of raster data, and the graphical output of results can be used directly as input for strategy management and decision making. To create a chart, right-click the layer you want analyze in the Contents pane, point to Create Chart, and click Temporal Profile to open the Chart Properties pane. You can use the Draw tool at the top of the Chart Properties pane to draw point features on the mosaic dataset, multidimensional raster layer, or netCDF raster layer in the map view. These point features are added to the feature table on the Chart Properties pane. In the feature table, you can select or deselect the point features, remove unwanted point features, and edit the symbol and label for each point. Based on the selection from the feature table, once a time series is defined, the temporal profile for each location is created and displayed on the same dialog box. The x-axis of the temporal profile displays the time in continuous time intervals. You can choose the time parameter names for the selected layer through the Time box. These time names come from either the general time fields in the layer’s attribute table or the time dimension if the layer is created from a multidimensional dataset. If the data has multiple time fields or time dimensions, all the time names appear in the Time box. The Time Interval Size parameter defines the time interval on the x-axis. If the temporal data is in evenly spaced intervals, the data’s original temporal interval is used as the default. For example, weather data generated from numerical models is usually archived in hourly, daily, or monthly time intervals. Therefore, no time aggregation is required to display the data, and the temporal profile will display the original pixel values without value aggregation. When the temporal data is at unevenly spaced intervals, it is binned into time intervals along the x-axis. A default interval size is chosen based on the temporal extent of the dataset and can be manually changed through the Time Interval Size parameter. The Time Aggregation parameter automatically changes to Mean when a new Time Interval Size value is specified. You can manually change Time Aggregation to Count, Mean, Median, or Sum. You can also use Time Interval Size and Time Aggregation to perform statistical analysis on your data. For example, aggregate your hourly data to daily, monthly, or yearly time intervals and visualize the trend at different time scales. The value displayed on the temporal profile is calculated based on the values that fall within the new time interval and the Time Aggregation parameter. Time intervals can align to the first or last data point. Aligning to the first data point initiates binning with the earliest date and progresses forward. Aligning to the last data point initiates binning with the most recent date and works backward. Binning from the last data point is important to consider because the last bin created may be partially empty, which can give the impression that there is a dip in the value or count during that time, when really the data collection began or ended during the span of the bin. To avoid binning bias, check the Trim incomplete time interval option. This will remove the partially filled bin from the visualization. One or more variables—Use this option when the temporal data is in a single band. It allows you to compare the trends of multiple variables in a mosaic dataset, multidimensional raster layer, netCDF raster layer, or image service. A graph is displayed for each variable at a selected location. One variable with multiple bands—This option works on temporal data in multiple bands; you can compare the time change of different bands over different locations. You specify the band names to plot on the temporal profile, and each band uses its own graph. The Add all and Remove all buttons allow you to add or remove, respectively, all band graphs on the temporal profile at once. One variable with multi-dimensions—This option works specifically on multidimensional data containing a time dimension and other dimensions. The supported multidimensional layer types are multidimensional mosaic dataset, multidimensional raster layer, netCDF raster layer, and multidimensional image service. The temporal profile is created based on the specific values in other dimensions, such as depth at the corresponding time value. For example, soil moisture data usually includes both a time dimension and vertical dimension below the earth's surface, resulting in a temporal profile at 0.1, 0.2, and 0.3 meters below the ground. Use the Add all or Remove all button to add or remove, respectively, all values in the other dimension on the temporal profile. Y-axis bounds—Default minimum and maximum y-axis bounds are set based on the range of data values represented on the axis. These values can be customized by entering a new y-axis bound value. Clicking the reset icon returns the y-axis bound to the default value. Standardized values on Y axis—If multiple variables are selected and their values range widely, check the Standardized values on y-axis option in the Axes category to include all the variables on the same scale, allowing multiple distributions to be visualized in the same chart. For example, you may want to visualize precipitation that is within a couple of inches per day, and the daily average temperature in Fahrenheit, such as 60–90 degrees, together. Standardization of the values on y-axis involves a z-transform where the mean for all values is subtracted from each value and divided by the standard deviation for all the values. Number format—You can format the way an axis will display numeric values by specifying a number format category or defining a custom format string. Time format—You can set date and time formats to display on the x-axis. Click the General tab at the top of the Chart Properties pane. Specify a title for your chart and legend, and label your x-axis and y-axis. You can add a detailed description of your temporal profile chart. Create a mosaic layer from a multidimensional mosaic dataset containing a soil moisture variable. Create two point features on the map, and change the labels to Location 1 and Location 2. Set Time to Standard Time. Set Time Interval Size to 1 month. Set Time Aggregation to None. Set Time Series to One or more variables. 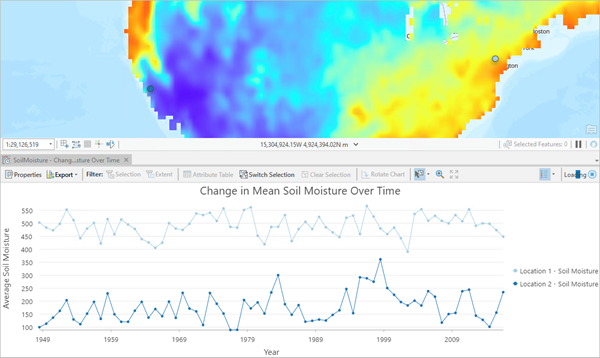 Select soil moisture in the time series table to create your temporal profile chart.